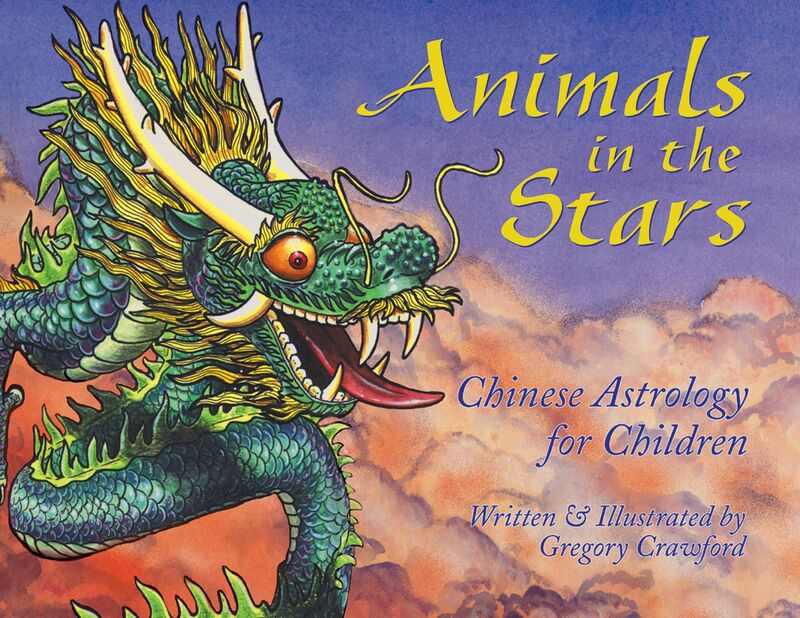 Lavishly illustrated guide to Chinese Astrology for children ages 8-12. • Illustrations and text describe the characteristics of each of the 12 animals of the Chinese zodiac and of those born under each sign. • Each animal is accompanied by a traditional Chinese folktale. • Offers a brief overview of Chinese astrology and the history of the Chinese zodiac. Anyone who has ever taken children to a Chinese restaurant and watched them read the paper placemat with fascination knows that children (and adults) love the playfulness and self-reflection of Chinese astrology. Now children can learn about the unique character traits and legends that make up the 12 animals of the Chinese zodiac, as well as experience a deeper appreciation for the cultural traditions behind Chinese astrology. Beautifully illustrated with lifelike animals that jump off the page, Animals in the Stars provides an informative and playful tool for self-exploration using this ancient tradition. The human personality traits of the 12 animals--both good and bad--are described in detail along with explanations of the significance of being born in the "year of" that particular animal. Each animal description is also accompanied by a traditional Chinese folktale further personifying the unique qualities and characteristics of that animal. Youngsters can enjoy these magical teaching tales while learning their "sign" as well as those of family members and friends. This wonderful introduction to the foundations of Chinese astrology is a perfect resource for the child seeking to know more about Chinese culture, zodiac animal characteristics, relationship dynamics, or esoteric traditions, as well as those seeking the simple fun inherent in the combination of astrology and animals. A long time ago, when the world was very young, there was a beautiful land called Zhonngguo, which means the Middle Kingdom. To this very day the people who live there call it by this name, but we call it China. The people of this enchanted land were very wise and closely watched the world around them. They watched the skies above and the oceans below; they observed the trees blossoming in the spring and shedding their leaves in the fall. They noticed the world as it grew green in the summer and as it dreamed under a blanket of snow in the winter. And they watched the animals, both wild and tame, as they went about their lives through every season. In this way the people of the Middle Kingdom learned how to live in harmony with nature. In fact, this way of living became so important to many of them that they gave it a name: Taoism (pronounced "Dowism"). Some of those who studied this way of living and followed it closely each day became knowledgeable and wise priests. These priests knew many things about the world: They could feel in the wind when the rains would come, and they could predict how great the harvest would be. But neither they nor the people of Zhonngguo had a way of marking and dividing time, as we do today with our calendar. And strangely enough, they did not always understand each other as well as they understood the animals around them. Some of the priests who lived in the Middle Kingdom were quite old; they had lived through many years. And as they looked back on their lives and thought about all that had happened in Zhonngguo, they began to see that some years were full of slow-but-steady effort and patient strength, as though the strong and steady Ox were in charge. Other years seemed full of courageous deeds and daring, just like powerful Tiger. Some were years of action and success, as though Monkey ruled over all, while others were time for careful thought and planning, as though guided by Snake. After talking to one another and closely watching the animals around them, they discovered that each year they could recall seemed to be influenced by one of twelve different animals: Ox, Tiger, Monkey, Snake, Rat, Boar, Rabbit, Dog, Horse, Rooster, Sheep, and (whether real or not!) the important Dragon. "A ha!" the priests said to one another. This meant to them that all time was governed by a repeating cycle of twelve years ruled by these twelve animals, an Ox year followed by a Tiger year, followed by a Rabbit year, and so on until all twelve years had gone by and the Ox year came around again--much like time for us is governed by a repeating cycle of twelve months, January followed by February followed by March, and so on until all twelve months have gone by and January comes around again. The priests called this cycle of twelve years the Twelve Earthly Branches--which today we call the Chinese zodiac. But their discoveries didn't stop there. Not only years were influenced by these twelve animals. All the people they observed seemed to be ruled by them too! Those born in a year ruled by Rooster, a year of hard work and discipline, were, sure enough, the hardest working, most disciplined people in the Middle Kingdom. And those born in a peaceful and happy Sheep year were the calmest and most content people anyone knew. The priests had discovered a way of both dividing time and understanding people--all in all, an amazing feat for which Huang Ti, the Jade Emperor, praised them greatly. "But," the emperor asked them, "if we are to use this system to help us mark time, we must know which year begins the cycle. You must decide which animal comes first." Gregory Crawford has been a professional artist for 37 years. His work has appeared in advertising and film and on TV, and he is the illustrator of Tai Chi for Kids. He lives in Gaysville, Vermont. "A delightful compilation that is a strongly recommended introductory overview for children to the basic principles of Chinese astrology." "Although the recommended ages are for children eight and up, almost anyone might enjoy reading about the Chinese legends."